Objective: As the second common malignant tumor in females, cervical cancer severely affects public health. Epithelial-Mesenchymal Transition (EMT) occurs in tumor cells and is a key factor for tumor infiltration and metastasis. MicroRNA (miRNA) can inhibit mRNA translation and thus may be associated with tumor EMT. This study treated cervical cancer Hela cell line with neo-gambogic acid, to investigate its regulation on mRNA, aiming to elucidate its effects on EMT occurrence and drug resistance. Materials and Methods: Human cervical carcinoma Hela cells were transfected with miRNA106b and miRNA93 vectors, and treated with different concentrations of neo-gambogic acid (0.5 μg/ml, 1.0 μg/ml, 1.5 μg/ml and 2.0 μg/ml) for different time points (24 h, 48 h and 72 h), followed by cisplatin treatment. Real-time PCR was used to detect the expression of miRNA. Cell invasion and migration were detected by Transwell assay, while Western blot was used to quantify the EMT-related protein expression. Results: With higher concentration and/or longer treatment time of neo-gambogic acid, expressions of miRNA106b and miRNA93 were decreased (p<0.05) in Hela cells, which also had reduced cell invasion and migration ability (p<0.05). The higher concentration of neo-gambogic acid decreased the protein expressions of N-cadherin, Snail and Vimentin, while increased E-cadherin expression (p<0.05). After treatment with cisplatin, the expression of miRNA was further decreased after treatment of higher concentration of neo-gambogic acid. Conclusion: Neo-gambogic acid can decrease miRNA106b and miRNA93 levels in Hela cells, increase cell sensitivity to cisplatin, increase E-cadherin expression, decrease N-cadherin, Snail and Vimentin expression, as well as inhibit Hela cell invasion and migration. Neo-gambogic acid, miRNAs, Cervical carcinoma, Epithelial-mesenchymal transition (EMT), Drug resistance. Cervical cancer is one of the most common malignant tumors in females. About 500,000 women were diagnosed with cervical cancer each year worldwide, only fewer than breast cancer. In China, there were over 135,000 newly-diagnosed cervical cancer patients each year, ranked as the second major cancer causing mortality in Chinese women . Epithelial- Mesenchymal Transition (EMT) is a feature of tumor stem cells. Recent study has shown the close association with EMT formation as well as the occurrence and development of epithelial-derived malignant tumors . The occurrence of EMT is mainly due to the loss of epithelial cell polarity, thus acquiring partial features of mesenchymal cells, leading to cell invasion and migration. Both in vivo and in vitro studies have found the widespread existence of EMT in pulmonary carcinoma, breast cancer and prostate cancer . Gamboge is secreted from Garcinia maingayii and has multiple effects including anti-toxicity and haemorrhage prevention. Recent study has shown the inhibitory role of gamboge on tumor cell growth, suggesting it might be a potential approach for treating breast cancer, lymphoma and skin cancer [4,5]. Basic study has indicated the major effective component of gamboge during anti-tumor effects as gambogic acid, neo-gambogic acid and iso-gambogic acid, all of which had wide spectrum of antitumor and potent activity . This study selected cervical cancer Hela cell, on which neo-gambogic acid was applied to test its regulatory effects on mRNA expressions, in an attempt to analyze its effect on EMT in cervical cancer, as well as on the drug resistance. Human cervical cancer Hela cell line was a gift from Xi'an Jiao Tong University (Shaanxi, China). Neo-gambogic acid was purchased from Bengbu Medical College (Purity 99%, lot number 20070224). DMEM culture medium, streptomycin/penicillin, foetal bovine serum was purchased from Gibco (US). Forward and reverse primers were synthesized by Sango (China). Lipofectamine 2000 transfection reagent was produced by Invitrogen (US). Mouse anti-human E-cadherin, N-cadherin, Snail and Vimentin monoclonal antibody were purchased from BioRad (US). Trizol reagent was purchased from Invitrogen (US). Fluorescent quantitative PCR kit was provided by Sango (China). Transwell chamber was purchased from Millipore (US). Incubation chamber was provided by Thermo (US). CO2 chamber and -80°C fridge were purchased from SANYO (Japan). Inverted microscope was provided by Nikon (Japan). PCR cycler model T1 was a product from Biometra (US). High-speed centrifuge was purchased from Beckman (US). Human cervical carcinoma Hela cells were cultured in RPMI1640 medium in a humidified chamber with 5% CO2 at 37°C. Recombinant pC1R1-miRNA106 expression vector was digested by EcoRI enzyme, and was extracted for target gene and linearized vector fragments for de-phosphorylation to prevent auto-circulation. Cells at log-phase were seeded into 6- well plate and divided into pcDNA3.1-miRNA106b transfection group and pcDNA3.1-miRNA93 group. MiRNA106 and miRNA93 vectors were transfected into cervical cancer Hela cells following the manual instruction of Lipofectamine 2000 kit. Hela cells at log-phase were counted and seeded into culture plate for attachment growth overnight. DMEM medium containing 2% Foetal Bovine Serum (FBS) was used for 24 hincubation, and replaced by DMEM containing 10% (FBS). Neo-gambogic acid at 0.5 μg/ml, 1.0 μg/ml, 1.5 μg/ml and 2.0 μg/ml were added into DMEM and incubated for different time periods (24 h, 48 h and 72 h), in parallel with the control group, in which Hela cells were not treated. Both experimental and control cells were treated with 20 μmol/ml cisplatin in a humidified chamber with 5% CO2 at 37°C. Hela cells at log-phase after transfection were collected and total RNA was extracted by Trizol kit following manual instruction. Total RNA concentration was determined by D260nm/D280nm. 200 ng total RNA was used to synthesize cDNA based on polyA tails. Using cDNA as the template, PCR amplification was performed using primers (Table 1) under the following conditions: 95°C denature for 30 s, followed by 40 cycles composed of 95°C denature for 5 s, 60°C annealing for 30 s.
Cell invasion assay: Matrigel was used to pre-coat Transwell chamber at 4°C overnight. Serum-free culture medium was used to hydrate the basal membrane, which was then incubated at 37°C for 1 h. After transfection, Hela cells were inoculated into the upper chamber of Transwell, while the bottom chamber was filled with RPMI1640 culture medium. The chamber was stained by Giemsa dye, observed and counted under an inverted microscope. Cell migration assay: Using the same procedures as the invasion assay, cells were seeded into the chamber without artificially basal membrane. Protein was extracted from Hela cells after transfection followed by detection of the concentration by a BCA assay kit. Proteins (40 μg per well) were separated in 8% SDS-PAGE and transferred to membrane, which was blocked under room temperature for 1 h. Mouse anti-human vimentin, N-cadherin and E-cadherin polyclonal antibody were diluted by 1:1200. Mouse anti-human SNAIL monoclonal antibody was diluted by 1:700 and incubated at 4°C overnight. Secondary antibody was then added for 1 h incubation, followed by development. SPSS17.0 software was used for statistical analysis. Data were presented as mean ± standard deviation (SD). At least three independent experiments were performed for each assay in this study. Two-way analysis of variance (ANOVA) with Bonferroni post-test was performed for comparison of the significance among multiple treatment groups at different time points. A statistical significance was defined when p<0.05. To evaluate whether neo-gambogic acid affects the expression profile of miRNA106b and miRNA93 in Hela cells, real-time PCR were performed. Results showed that with higher concentration and/or elongated treatment time of neogambogic acid, the expressions of both miRNAs were significantly decreased (p<0.05). At all concentration sub-groups, the expressions of these two miRNAs in experimental group were significantly lower than those in the control group (p<0.05) (Table 2). Note: 1p<0.05 compared to control group; 2p<0.05 compared to 0.5 μg/ml group; 3p<0.05 compared to 1.0 μg/ml group; 4p<0.05 compared to 1.5 μg/ml group; 5p<0.05 compared to 24 h group; 6p<0.05 compared to 48 h group. Table 2. MiRNAs expression in Hela cells. Transwell assay was performed to assess the effect of neogambogic on the invasion and migration ability of Hela cells. After treatment of 2.0 μg/ml neo-gambogic acid for 72 h, we found significant decrease of cell invasion and migration activities of Hela cells (p<0.05, Figure 1). Figure 1: Hela cell invasion and migration ability. (A) Cell invasion in experimental group (X200); (B) Cell migration in experimental group (X200); (C) Cell invasion in control group (X200); (D) Cell migration in control group (X200). As reduced cell invasion and migration were observed in Hela cells after neo-gambogic treatment, suggesting this reagent might affect EMT. To investigate that, we measured the protein expression levels of E-cadherin, N-cadherin, Snail and Vimentin by western blot. Results showed that with higher concentration and/or elongated treatment time of neo-gambogic acid, the expression levels of N-cadherin, Snail and Vimentin were all decreased while E-cadherin protein expression was elevated (p<0.05). At all concentration sub-groups of experimental group, there was a significant difference compared with control group (p<0.05, Table 3 and Figure 2). Table 3. 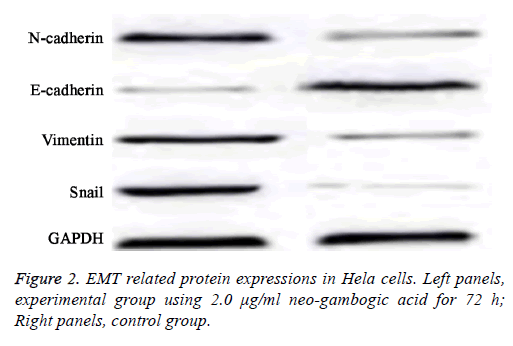 Expression of EMT-related proteins in Hela cells after transfection. Figure 2: EMT related protein expressions in Hela cells. Left panels, experimental group using 2.0 μg/ml neo-gambogic acid for 72 h; Right panels, control group. To further investigate the effect of cisplatin treatment on the expressions of miRNA, we performed real-time PCR to detect the expression of miRNA106b and miRNA93 expression in cisplatin treated Hela cells. Results showed that in those cisplatin-treated cells, elongated time period and higher concentration of neo-gambogic acid further decreased miRNA expressions (p<0.05, Table 4). Table 4. MiRNA expression in cisplatin-treated Hela cells. The rapid increase of cervical cancer incidence and the younger age of patients have been observed recently. Although the improvement of diagnostic technique has significantly reduced the mortality rate, the strong malignancy and higher mortality rate still severely affect the survival time and life quality of patients . EMT is widely distributed in multiple malignant tumors with epithelial tissue derivation, and is mainly featured as the loss of epithelial cell polarity and acquirement of mesenchymal cell property, thus facilitating tumor infiltration and migration . Recent studies have indicated that miRNA mutation and further expressional alternation may modulate the posttranscriptional expressions of target genes, thus affecting the sensitivity of tumor cells in response to chemotherapy agents . As a family of non-coding RNA, miRNAs can specifically bind to 3’-untranslated region (3’-UTR) of target gene(s) to degrade mRNA, thus mediating post-transcriptional modification . In this study Hela cells were transfected with miRNA106b and miRNA93. With different concentrations and time periods of neo-gambogic acid treatment, we found the decrease of the expressions of both miRNAs with higher concentration and/or elongated treatment periods. These results suggested that intervention using neo-gambogic acid on Hela cells could decrease the expression of miRNA106b and miRNA93 in a dose-dependent and time-dependent manner. Previous study has shown the synergistic effect of miRNA106b and miRNA93 in miRNA106b family in gastric carcinoma as they can suppress the expression of cell cycle-dependent protein kinase inhibitor P21, P57 and P27, leading to facilitation of G1/S transition of cells to accelerate cell cycle of cancer . In breast cancer, it has been known that miRNA106b, miRNA93 and miRNA25 had synergistic effects on modulating SMAD37 to activate TGF-β signaling pathway, resulting in the acceleration of EMT . This study treated Hela cells with 2.0 μg/ml neo-gambogic acid for 72 h and found significantly decreased migration and invasion activities as demonstrated by Transwell assay, suggesting that neo-gambogic acid could regulate the invasion and migration of cervical carcinoma cells. Further Western blot assay was performed for analysis of the expression levels of Ecadherin, N-cadherin, Snail, and Vimentin proteins and found decreased expressions of N-cadherin, Sanil and Vimentin and elevated E-cadherin proteins with higher concentration and/or elongated treatment periods of neo-gambogic treatment. These results indicated that neo-gambogic treatment could decrease the expressions of N-cadherin, Sanil and Vimentin and elevated E-cadherin expression in a dose- and time-dependent manner. EMT is known to be related with tumor invasion and migration mainly due to the loss of epithelial features and cells, which acquire mesenchymal features . E-cadherin is a tumor-suppressor gene as its decreased expression could stimulate the peripheral infiltration and migration of tumor cells . N-cadherin, however, mainly inhibits cell apoptosis and is positively expressed during embryonic differentiation and formation . Vimentin is mainly distributed in mesenchymal tissues and is an important cytokine in accelerating tumor progression . Snail could bind to Ecadherin gene promoter to inhibit gene expression and facilitate vimentin expression, leading to EMT in tumor cells. The high-expression of Snail is closely correlated with the occurrence, progression, invasion and migration of cervical cancer . This study probably suggested that neo-gambogic acid could inhibit Hela cell invasion and migration via increasing E-cadherin expression and decreasing the expressions of N-cadherin, Snail and Vimentin, in order to manage EMT occurrence. We further treated those Hela cells after neo-gambogic acid treatment with cisplatin. Real-time PCR found decreased expressions of miRNA106b and miRNA93 in those neogambogic acid treated Hela cells after cisplatin intervention. With higher concentration and/or elongated treatment time of neo-gambogic acid, the decrease of miRNA expressions was even more significant. Cisplatin is a common chemotherapy drug in clinic, and is the primary choice for chemotherapy against cervical cancer. It can form DNA complex to activate cell cycle related proteins to participate DNA injury response, leading to induction of cell apoptosis . Previous study has found the down-regulation of miRNA106b and miRNA93 in Hela cells after cisplatin intervention, suggesting the possible involvement of those miRNAs in cisplatin-induced DNA damage. Moreover, knockout of RAD1, which is the target gene of miRNA106b and miRNA93, could significantly increase cell sensitivity to cisplatin [19,20]. These studies suggested that miRNA106b and miRNA93 might be involved in the drug resistance of Hela cells. Neo-gambogic acid thus might increase the sensitivity of Hela cells to cisplatin and decrease the incidence or drug resistance via decreasing expressions of miRNA106b and miRNA93. In summary, neo-gambogic acid can decrease the expression of miRNA106b and miRNA93 in Hela cells in a dose- and timedependent manner. Neo-gambogic acid could also increase the sensitivity of Hela cells in response to cisplatin and decrease the incidence of drug resistance. It may also inhibit cell invasion and migration via elevating E-cadherin and depressing N-cadherin, Snail and Vimentin expressions, thus managing occurrence and progression of EMT, although its exact molecular mechanism requires further illustration in the future. Lao G. Mir-155 promotes cervical cancer cell proliferation through suppression of its target gene LKB1. Tumour Biol 2014; 35: 11933-11938. Zheng LD. Enhanced expression of resistin-like molecule beta in human colon cancer and its clinical significance. Dig Dis Sci 2009; 54: 274-281. Lukaszewicz-Zajac M. Comparison between clinical significance of serum pro-inflammatory proteins (IL-6 and CRP) and classic tumor markers (CEA and CA 19-9) in gastric cancer. Clin Exp Med 2011; 11: 89-96. Wang T. Gambogic acid, a potent inhibitor of survivin, reverses docetaxel resistance in gastric cancer cells. Cancer Lett 2008; 262: 214-222. Cheng H. Gambogenic acid inhibits proliferation of A549 cells through apoptosis inducing through up-regulation of the p38 MAPK cascade. J Asian Nat Prod Res 2011; 13: 993-1002. Yan F. Gambogenic acid induced mitochondrial-dependent apoptosis and referred to phospho-Erk1/2 and phospho-p38 MAPK in human hepatoma HepG2 cells. Environ Toxicol Pharmacol 2012; 33: 181-190. Lee MY, Shen MR. Epithelial-mesenchymal transition in cervical carcinoma. Am J Transl Res 2012; 4: 1-13. Thiery JP, Lim CT. Tumor dissemination: an EMT affair. Cancer Cell 2013; 23: 272-273. Visone R, Croce CM. MiRNAs and cancer. Am J Pathol 2009; 174: 1131-1138. Novotny GW. Translational repression of E2F1 mRNA in carcinoma in situ and normal testis correlates with expression of the miR-17-92 cluster. Cell Death Differ 2007; 14: 879-882. Kim YK. Functional links between clustered microRNAs: suppression of cell-cycle inhibitors by microRNA clusters in gastric cancer. Nucleic Acids Res 2009; 37: 1672-1681. Smith AL. The miR-106b-25 cluster targets Smad7, activates TGF-beta signaling, and induces EMT and tumor initiating cell characteristics downstream of Six1 in human breast cancer. Oncogene 2012; 31: 5162-5171. Szczepanik AM. IL-6 serum levels predict postoperative morbidity in gastric cancer patients. Gastric Cancer 2011; 14: 266-273. Liew PL. Prognostic and predictive values of Nrf2, Keap1, p16 and E-cadherin expression in ovarian epithelial carcinoma. Int J Clin Exp Pathol 2015; 8: 5642-5649. Mrozik KM. Therapeutic targeting of N-cadherin is an effective treatment for multiple myeloma. Br J Haematol 2015; 171: 387-399. Jones SA, Scheller J, Rose-John S. Therapeutic strategies for the clinical blockade of IL-6/gp130 signaling. J Clin Invest 2011; 121: 3375-3383. Lee MY. Epithelial-mesenchymal transition in cervical cancer: correlation with tumor progression, epidermal growth factor receptor overexpression, and snail up-regulation. Clin Cancer Res 2008; 14: 4743-4750. Shen Y. miR-375 is upregulated in acquired paclitaxel resistance in cervical cancer. Br J Cancer 2013; 109: 92-99. Barabas K. Cisplatin: a review of toxicities and therapeutic applications. Vet Comp Oncol 2008; 6: 1-18. Jansson K. A role for Myh1 in DNA repairs after treatment with strand-breaking and crosslinking chemotherapeutic agents. Environ Mol Mutagen 2013; 54: 327-337.